As usual, the disclaimer applies that things in the future are subject to change. I won’t repeat the slides I’ve seen here or seen several times before. You can see above the roadmap is very packed. We had over 60 questions in the question & answer, so below I highlight a few – thank you, Ramu, for answering so many questions. 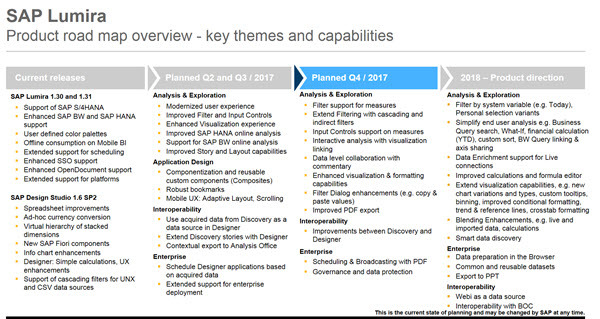 Q: is both discovery and designer good for non sap data sources ? A: Designer has Live connection to BW, HANA and UNX. Discovery supports connectivity to all other sources supporting JDBC connectivity via FHSQL including UNX, HANA and BW. Additionally, you can create your own extensions to connect to specific sources. Q: Why Velocity in-memory engine and not HANA? A: Velocity engine is a version based on HANA which is packaged along with Discovery for customers to avoid dependency HANA. If you have HANA, you can connect to HANA in Live mode and delegate all calculations to HANA to take advantage of it instead of Velocity. Q: Is the velocity engine also installed onto the desktop/laptop with the Lumira Desktop installation? Q: Is there a limit of data cells in the “In memory Data engine”? Q: Can calculated measures be created in Lumira with the BW Live connection? A: with Lumira 2.0 release, we don’t support data preparation and enrichment capabilities. Its planned for future releases. Q: I’m on the Lumira 2.0 beta program. If I found a bug, where should I record it? A: If you are part of EAC, then please create an issue in BCP. If part of Open Beta, please share it with your SAP Contact supporting Open Beta which we will collate. Q: During the transition phase – will we be able to install 2.x client on machines that have Lumira Desktop and Design Studio client installed on? Or we have to uninstall 1.x clients first? Q: Will the Crosstab component’s vertical scrolling perform more quickly as in the current version of Lumira or will it remain slow as in Design Studio? A: We are actually using Design Studio XTab in Lumira 2.0. Having said that, we have couple of enhancements planned for XTab scrolling experience. Q: Can you please elaborate on the planned XTab enhancements and when they might become available? This is very important to us and our users. Q: Will we have the possibility to create a cascade prompt directly on a datasource? A: You can today pass values to Prompts or Variables created at Source. and additionally filter data only from BW during acquisition. Q: Will the definition of calculated key figures, restricted key figures, and structures within BEx Query designer eventually move to Lumira’s data preparation area? A: Lumira Discovery isn’t planned to be a Query Designer. However, we plan to deliver few capabilities or data enrichment like Creating calculated measures, Geo hierarchies, Custom hierarchies, Blending with other sources etc..
Q: Will Lumira 2.0 release or higher release support direct connection to ABAP CDS View in S/4HANA (similar to Fiori Query Browser) or it will continue to consume exposed transient providers? Q: To use SAP HANA Live connection what’s required on the SAP HANA side? In the server field there is a comment that it should be XS Engine URL:Port. Q: Will the Lumira Sizing Guide obe revised before Lumira 2.0 GA? 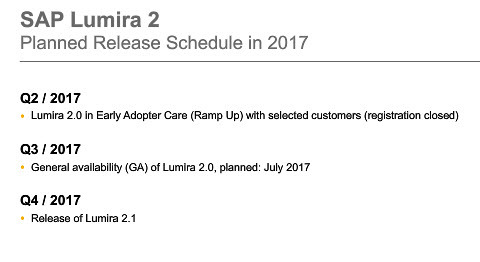 Or does the current guidance for LS4BIP 1.31 carry over to Lumira 2.0 (server)? A: We do plan to have updated Sizing guide for Lumira 2.0. in the meantime, 1.x guide can still be a reference. Q: Will we able to use it in all function on MOBILE SAP APP? Q: Is full compatibility with 4k (High-DPI) monitors planned? Q: Are standard filter variables like current day, current fiscal period, etc. available? A: Not out of the box in Discovery, you can script is in Designer. we do plan to support this out of the box in future releases. Q: can you format colum widths and row heights? Q: Hi, can we fomat the numbers for measures in Milions, Thousands, etc. instead of having to create a new variable as we had to in WebI ? A: Yes, you can do number formatting in visualizations for better readability. Q: When I update the server component to Lumira 2.0 – can I then uninstall Design Studio Add-on 1.x and the Lumira Server for BI Platform 1.x installation? Or those installations will be required to remain on the machine for the base install? Q: is the map provided by ESRI? Q: Is it possible to map data two different datasets in a single geo chart? Q: Is snap to grid (automatic alignment) for charts planned? It should be pixel perfect. Currently it’s quite difficult to align them properly. A: in Discovery 2.0, we reuse the canvas from Design Studio. It support pixel perfect placement. and inserting a visualization results in automatic alignment and placing by application. Q: Are the slides available? Q: At the moment there is a restriction in Design Studio 1.6 to consume max. 50000 data cells. Is this restriction still existing in Lumira Designer, too? A: I assume you are referring to via UNX, that would be solved by using Datasets from Lumira Discovery to build applications. Q: Will the real time package for live streaming be available in Lumira2? A: the streaming connectivity we have in DS 1.6 would be continued to supported in Designer only in 2.0. we plan to extend that for Discovery in future release. Q: Is Lumira 2.x able to consume data from Google BiqQuery natively? A: Not available Out of the box, you can either use JDBC (if its supported) or build a Data access extension. Q: Will the Lumira server be suported in Linux?? Great blog, thanks Tammy. Do you happen to know if GA is still planned for July? Hi Dan – thank you for reading. Looks like CW34 per this SAP Note: https://launchpad.support.sap.com/#/notes/2465894/E – August, right? I am trying to change the label of my values ​​format for a bar chart, but it is not possible (Lumira Discovery), I did the same exercise for a table and if it works I can convert to thousands and remove the decimals, but in graph I I could not, you can help me. Thank you.